For example, it is no more a miracle that phones are convenient for managing your emails faster and more efficiently. 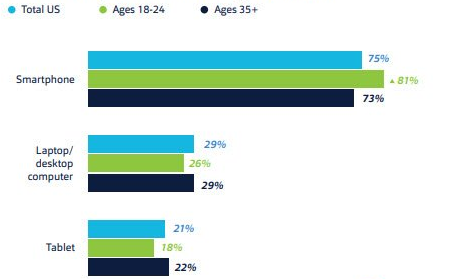 Compared to other gadgets such as laptops or tablets, smartphones cover the biggest percentage of users aged from 18 to 24. Such a quick development of the mobile area has caused the appearance of a majority of online tools. These tools are mainly commercial and targeted at your marketing purposes. So, in this blog post we will talk about 5 most popular mobile services to boost your marketing campaign. AdMob is the product of Google. The mobile application helps generate revenue from your mobile application. By using it, you can create in-app ads for your target audience and show it at any chosen time. This tool allows you to choose from the variety of ad templates, create static and dynamic versions, customize ads to correlate with the look and feel of your app, and create the best user experience. You can monetize your own app much faster with this awesome marketing tool. This mobile application is meant to maximize the effectiveness of your marketing campaign. With the GetResponse mobile application, you can make smarter decisions by comparing follow-ups, segmenting subscribers just in one click, and measuring site conversions. To be more precise, GetResponse is the email marketing platform for managing online campaigns. It helps identify target audience, send them effective emails, create the series of automated trigger emails, and hold webinars. You can adjust the design of your emails by using ready-made templates. No mobile marketing campaign can go without a mobile-friendly email signature. While the statistics shows that more and more emails are being opened on smartphones, it is so critical to optimize your email signature for mobile devices. MySignature is a free mobile generator with multiple professional mobile email signature templates. It makes it so easy to build a compelling email ending on the run without wasting so precious time today. We figured out that it takes merely 2 minutes to generate a mobile-friendly email signature with our service. This amazing mobile application helps manage social media accounts effectively. If the priority in your marketing campaign is laid on social media, you simply can’t go without Buffer. The key feature is scheduling posts both with text and image on various platforms such as Twitter, Facebook, or Instagram. Buffer also enables you to track the interest of subscribers to your post and plan more effective content based on the analytics reports. The app can be useful both for companies and individuals. Localytics is a mobile marketing application with unique web analytics features for campaign attribution, retention analysis, and lifetime value. By applying this service, you will see that it is so easy to drive your business outcomes. As they say in Localytics, their service is created to discover, engage, and optimize. It means you will know everything about the audience of your application, how they use it and for which purposes, and also you will get some suggestions how to increase their engagement even more.